An international team led by scientists from IPN Orsay (CNRS/Université Paris-Sud), CEA, and RIKEN (Japan) has performed the first spectroscopy of the extremely neutron-rich isotopes krypton 98 and 100. This experiment showed that there are two coexisting, competing quantum shapes at low energy in 98Kr, never before seen for neutron-rich Kr isotopes. The team also showed that these isotopes experience a gentle onset of deformation with added neutrons, in sharp contrast with neighboring isotopes of rubidium, strontium, and zirconium, which change shapes suddenly at neutron number 60. This study marks a decisive step towards an understanding of the limits of this quantum phase transition region, and was published in Physical Review Letters. How protons and neutrons are arranged in a nucleus depends directly on the force that binds them together. This nuclear interaction, still poorly understood, gives rise to sometimes sudden and surprising quantum phenomena like the complete spatial rearrangement of nucleons when passing from 59 to 60 neutrons in the zirconium (atomic number 40) and strontium (atomic number 38) isotopes. These abrupt changes illustrate the complex interplay between the collective properties of nuclear systems, like shapes, and their intrinsic microscopic degrees of freedom, such as neutron and proton numbers. Studying and understanding this interplay is essential for constraining nuclear models. Until now, krypton isotopes had been studied up to 96Kr, which has exactly 60 neutrons and was known to be the stopping point for the shape transition. This experiment conducted at RIKEN permitted scientists, for the first time, to determine the energy of the first excited states in 98,100Kr and to evidence a progressive increase of deformation going from 60 to 62 or 64 neutrons. 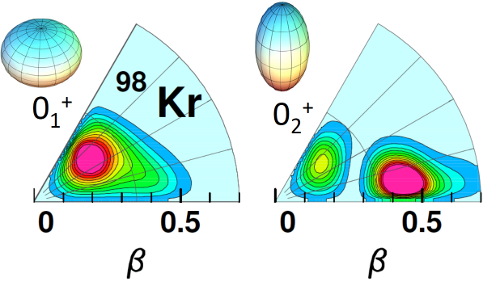 Beyond the somewhat slower evolution of the equilibrium shape for these nuclei, an excited state measured at low energy hints at the presence of another competing configuration. Theoretical models link the presence of these low-lying states to the coexistence of two different ellipsoidal shapes at low energy. These results were made possible by the production of very neutron-rich nuclei at the Radioactive Isotope Beam Factory (RIBF) at the RIKEN Nishina Center for Accelerator-Based Science in Japan. Approximately 150 billion uranium 238 nuclei per second were accelerated to 70% of the speed of light and collided with a beryllium target. The fission products created during this collision were sorted in-flight by a magnetic spectrometer and sent onto a cryogenic liquid hydrogen target to synthesize the nuclei of interest via proton knockout. These knockout reactions were identified via a time projection chamber located around the thick liquid hydrogen target (100 mm), comprising a system known as MINOS. Finally, the electromagnetic de-excitation that occurs quasi-instantaneously for these exotic nuclei was detected with the DALI2 detector, which detects gamma rays emitted by nuclei using 186 scintillators. The combination of these instruments and technologies is world-unique, and essential for studying these heretofore inaccessible nuclei.